My plans for this weekend included two things, and two things only: red wine and sewing. We started off nicely enough; coffee on the couch and taking our time getting started. But, things escalated rapidly. The pigs got out of their pen. Then when I was getting dressed I got a text from Paul, who was downstairs. It was a picture. Of a snake. Half way up our porch door. It was about a four-foot long black snake, and it was climbing up the screen door we have propped up outside. We never use the porch door; it leads out to the side porch that one day we will screen in, but right now tends to be a haven for spiders and wayward bugs. After Mr. Snake was sent off to the woods, Paul banged on the window to tell me to look at the bees. Now, first of all, I must preface by telling you that yesterday I noticed a sign in my new neighbor’s yard, proudly proclaiming they’d just been treated by The Mosquito Authority. So I called said company, and they reassured me that the product they use poses no threat to honeybees and only killed off ticks and mosquitoes. So I did research. They use a chemical called bifenthrin. After searching many, many sites on the internet and consulting with honeybee experts, I came to understand that the only people on the planet claiming bifenthrin is safe for bees is the company in the business of spraying it all over peoples’ yards. (The EPA website lists it as “highly toxic” to bees). So, this morning when Paul told me to check on the bees, I was pretty worried. Turns out, they were swarming. Swarming is actually not a huge deal. A hive gets too big, a queen gets too old, or a hive has a proclivity to swarm, and BAM. Half the bees take off with one queen, leaving half behind with the second. I had a second hive for the swarm to move into, but sadly they flew too far and we’ve been unable to catch them. I have a lure set out, but it’s anybody’s guess whether I’ll catch them. I’m still pissed at my jackass neighbor, though. And the pigs got out again. Whatever. At least those pork butts are smart and they come right back if you’ve got food. I will leave you with some cute news so you don’t think it’s all bad (I have since poured myself a big glass of wine). 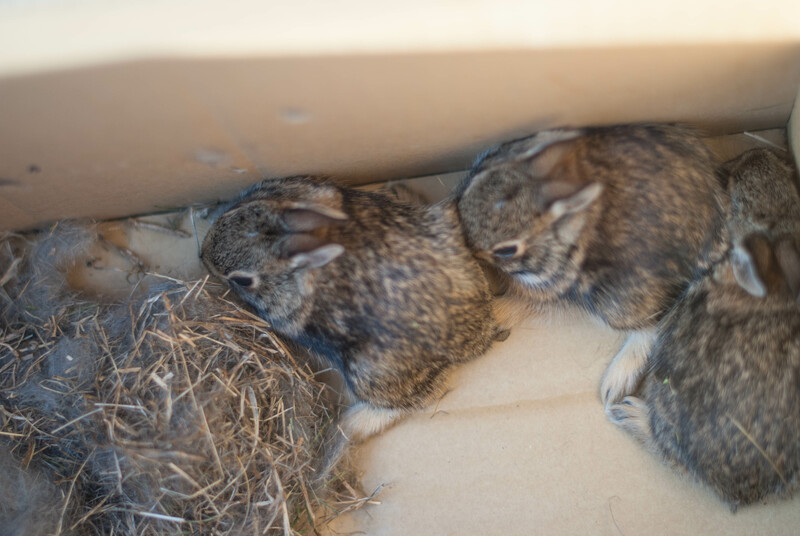 Last week Paul went to get new tires put on the car, and while he was there the mechanics found a small group of baby bunnies whose mother had been killed. 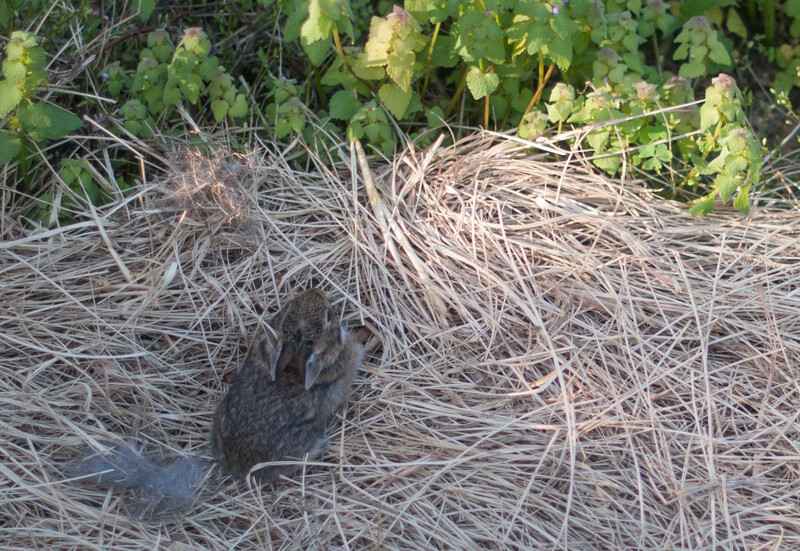 They had them in a box but didn’t know what to do with them in that urban setting. 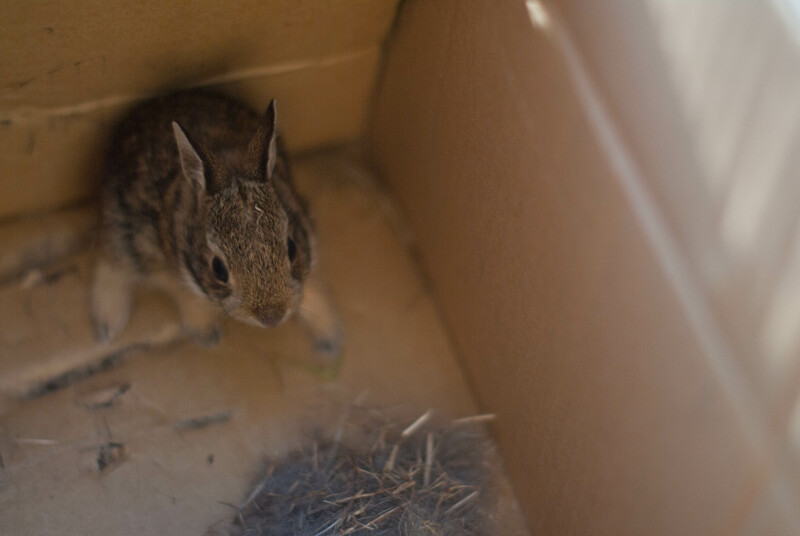 Paul brought them home and we set them free in the front garden, where we figured they’d be fairly safe and secure. 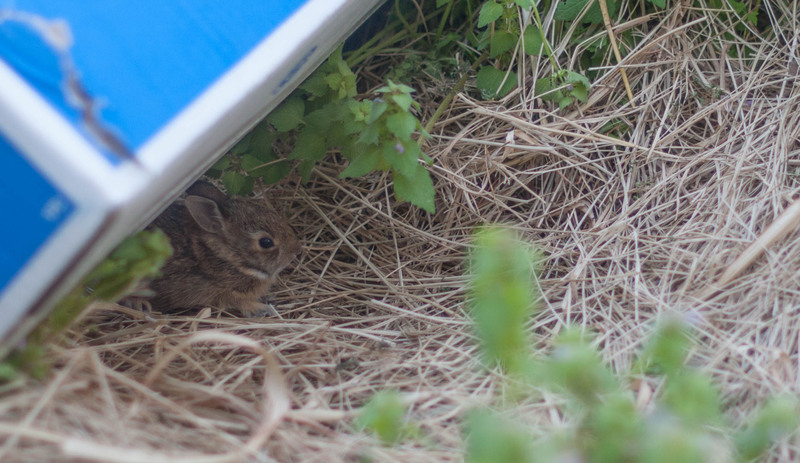 Most of them hopped off right away, but one little guy stuck around in the safety of the vegetable rows for awhile. We’ve caught glimpses here and there of at least one in the evenings. We at least gave them a fighting chance. Here’s to a less exciting tomorrow! This entry was posted in Uncategorized and tagged Farm, Garden. Bookmark the permalink. what an exciting day – whew….. I’m with you on the mosquito spraying companies – we saw a big decrease in butterflies the first 2 summers a neighbor had a similar company come and spray. I was just lucky the lady who owned the company was nice enough to let me know when they would be there so I could make sure windows were closed and I wasn’t outside. 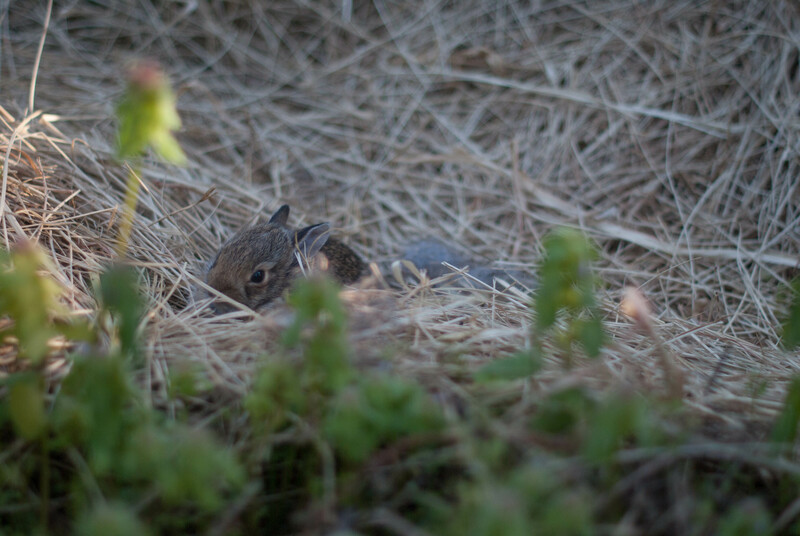 We’ll see this summer if the butterflies come back – 2nd summer where the neighbor hasn’t used the company. We need our bees!